Circa 1850. Single and 2-storey gabled cottage. Advanced gabled bay to left, crowstepped gables with obelisk finials. Coursed yellow sandstone. Projecting cills, stugged hoodmoulding to openings. S (PRINCIPAL) ELEVATION: advanced gabled bay to left, window to ground, smaller window to gablehead, gabled entrance porch facing to right to right return, timber door with fanlight above; window to bay to right, dormer breaking eaves above. N (REAR) ELEVATION: advanced gabled offices wing to right, abutting smaller advanced wing to left. W (SIDE) ELEVATION: gable end, irregular fenestration. E (SIDE) ELEVATION: gable end, single window to upper storey. Modern double glazing, grey slates, coped stacks, cast-iron rainwater goods. Was part of the vast Wishaw Estate belonging to Lord Belhaven and not related to Cambusnethan Priory. 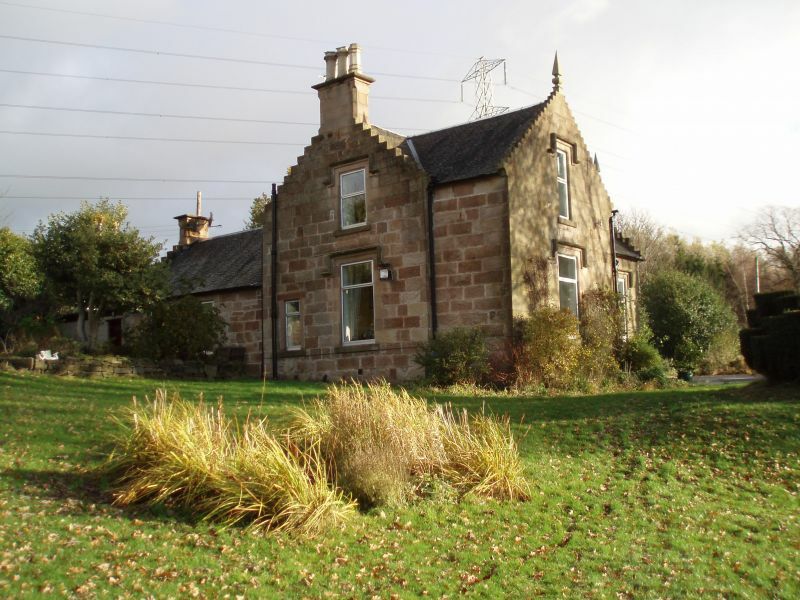 It is shown on the first edition OS map of 1859 as 'Kirkhill Cottage' and was probably the tenanted farmhouse overseeing the surrounding fruit orchards. At this point the house had a large orchard to the south, 'Kirkhill Orchard', and a track running east-west from the end of the drive linked to Ranald's Orchard and Carbarns Orchard, each orchard with its own labourers' cottages. The south facing slopes making the area ideal for fruit farming. The house was definitely not related to the churchyard, the path to which bounded the house to the north and west but did not connect to the driveway. The graveyard is shown on the 1859 map as being disused, the parish church having been moved to Cambusnethan village in 1650, two hundred years before the house was built. The house itself dates from around 1855, the same date as Wishaw House itself, and was probably designed by the studio of the Wishaw House architect, James Gillespie Graham, as part of the general estate improvements. Gillespie Graham was the leading Scottish architect of the time, famously responsible for Taymouth Castle, Perthshire and Moray Place and Royal Circus in the Edinburgh New Town. Very few of the estate buildings still survive. Wishaw House itself was blown up in 1952 but there is a former gatehouse of similar style to Kirkhill Cottage on the Glasgow Road in Craigneuk. Whilst the Coach House and Foresters Cottage can be found off Glen Road behind the golf course in Wishaw.